Soak channa in water overnight. In a pan, add 2 tsp of oil. Roast coconut till it turns brown. Fry for another 2 minutes with dry curry powders (chili, coriander, masala, turmeric). Let it cool and grind well. 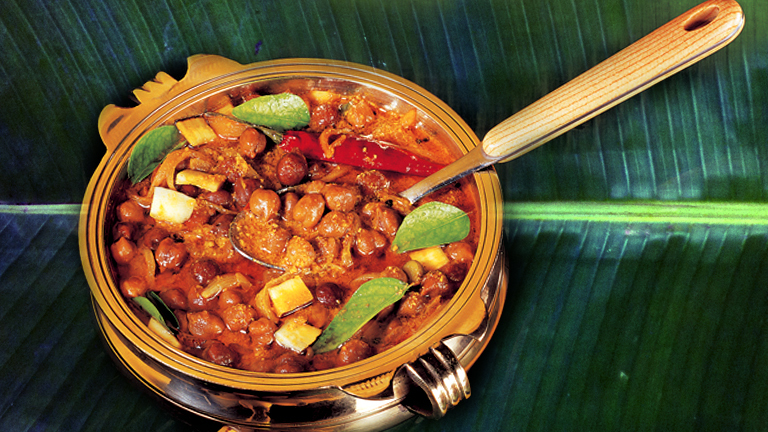 Cook channa in a pressure cooker with salt and water. In a pan, add oil. Add onions, tomatoes, cooked channa, ground masala and sauté well. Add required amount of water and salt. Let it boil. In another pan, add 2 tsp of oil and splutter mustard seeds. Add curry leaves and dried red chilies. Add this to the channa curry.